Sabermetric Research: Are eBay baseball card buyers racially biased? Here's a nice recent post by Bo Rasny, "Ten Articles on Baseball Cards and Race". Number ten is actually one of my own posts ... I'm going through the other nine. Most of them are academic studies, some of which aren't available in full. But this one is, a downloadable 2011 study called "Race Effects on eBay." It finds that cards auctioned on eBay by black (African American) sellers sell for significantly less money than cards by white sellers. Authors Ian Ayres, Mahzarin Banaji and Christine Jolls -- I'll call them "ABJ" -- bought 394 baseball cards on eBay in order to resell them. Before posting their auctions, they split the cards into two groups, at random (actually, alternating alphabetically, but close enough). The first group would ostensibly be posted by a black seller, and the second by a white seller. When all was said and done, it turned out the white sellers' cards went for 14 or 20 percent more than the black sellers' cards, depending on how you look at it. The result was significant at 2.2 SDs, and the authors conclude that eBay bidders discriminate by race. It's kind of a fun study. But, as usual, I'm dubious. Suppose you want to find out whether white sellers can sell their car for more money than black sellers. So you get a bunch of BMWs, and a bunch of Chevrolets, and assign them randomly to your test subjects. It turns out the white sellers got higher prices than the black sellers. But, what if the white sellers got more expensive cars to sell? It could be that the white guys (and gals) wound up with 70 percent of the BMWs, and that's might explain why they got the results they did. If that's what happened, it explains what happened without recourse to race, right? It doesn't matter that the cars were assigned randomly, with the best random number generator money can buy. Remember, even the best-designed study is going to give a false positive, by chance, 5 percent of the time. This would be one of those times. The fact that we see the intermediate result -- more BMWs for white guys -- lets us catch that false positive for what it is. Of course, if the cars were assigned randomly and *we never looked* at which races got which cars, we'd publish our study without hesitation. It would still be a false positive, but we wouldn't know it. Well, that's what happened with the baseball cards. The authors showed the original purchase prices of the cards in the two groups. One group sold cards that were originally purchased for an average of $9.82 each, and the other sold cards that were purchased for an average of $9.23 each. And that difference was statistically significant at the 5 percent level! That is: one group got significantly "more expensive" cards to sell than the other group! It's exactly like the BMW and Chevy example. Except -- and here's the interesting part -- the difference went the *other way*. It turned out that the white sellers had the "cheaper" cards, and the black sellers had the "more expensive" cards! In that case, it looks like that makes the effect *harder* to explain, not *easier*. In fact, the effect is "double" what we thought it was. Not only did the white sellers get more for their cards, but they did so even while selling less worthy cards in the first place! The thing is, though, I'm not sure they *were* less worthy cards. And that's the next part of the argument. As you can imagine, when the authors auctioned off the cards they just bought, they didn't sell for the exact amount as the purchase price. Sometimes they sold for more, and sometimes less. But, mostly less. A lot less. It appears that, on average, the authors paid $9.75 for their cards, and sold them for around $6.15. They took a 37 percent bath. It seems that ABJ overpaid quite a bit for the cards they bought. How is that possible, in an auction format? On eBay, you never pay much more than the second-highest bidder. Even if you bid $1000 ... if the next highest bid was $1, you'd wind up paying only $1.25. It might be just because cards in this price range vary a lot in winning bids. It's kind of random, depending on how many people happen to be interested at that particular time. One sold at $7.50. The other sold six weeks later at $13.49, almost double. The first one had only two bids, while the second one had ten. The first auction drew bids only on the last day. The second one started drawing bids three days before the auction's close. It's probably just a random thing -- the first auction had one serious bidder, while the second one happened to have two. Checking out another card from the study, 1975 Topps #195 ... in PSA 8, there were three: $23, $33.57, and $45. In PSA 7, they're more consistent, from $9.95 to $11.95. So: prices vary a lot. And, I think, the authors' rules for when to bid amount to selective sampling on the expensive auctions. First: they chose only auctions with existing bids. The auctions where the price gets bid up are the ones most likely to have bids early. 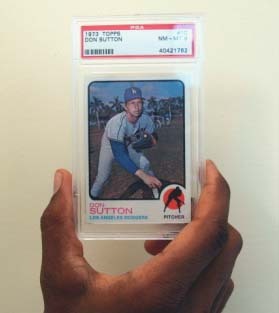 If ABJ chose to visit eBay on a random day, they'd be three times more likely to wind up in the second Don Sutton auction than the first. Second: ABJ chose only auctions where the existing high bid was between $3 and $8. But bids don't reach close to their final level, usually, until close to the end of the bidding... sometimes, even, the last few minutes of a week-long auction. That means the authors, again, selectively sampled those auctions where the price had been bid up early. The weighted average of selling prices, by time over $3, is $4.80. The average price overall was $4.01. ABJ's strategy, in this case, would have them overpay by 20 percent. ABJ acknowledge that they overpaid for the cards. They write, " ... in purchasing the cards initially we did not exert significant effort to minimize our buying prices." It doesn't really matter that the selling prices were lower than the purchase prices ... so this isn't meant to be a criticism. But the pattern of how the cards were bought is something that's going to factor into my coming argument. But, 40 cents is 40 cents, right? The cards that cost more actually *did* bring in more, so means the black/white effect is still compounded. It's still true that the white sellers brought in more money while selling cards that should have brought in *less* money. Not as much less as originally thought, but still less. Right? Well ... it's possible that there's something else going on. It may sound a little contrived, but ... I think it might be right. That is, I'm not just playing devil's advocate in trying to shoot down the finding: I actually think it's plausible. Suppose (to simplify things) that there are two types of cards sold on eBay. Group 1 cards are "commodities". There are lots of copies sold, and prices are pretty constant. There are many "buy it now" copies available, so nobody bids prices up too high, because you can always just abandon the auction and buy the card at a fixed price. Group 2 cards are "obscure". They're not actually obscure in the real world -- there are lots of them around -- but they're scarce on eBay, since they're low demand and harder to sell. They don't come up for auction much. Common cards, say, or semi-commons. If you have one of those, you might just put it up on a fixed-price basis, since there aren't going to be throngs of people lining up to bid. You can't pay too much for "commodity" cards. For "obscure" cards, though ... it's a crapshoot. There are few bidders. If you're the only bidder, you get it cheap. But if there's competition, the card goes for more than it's "worth", because it's a card that doesn't come up often and you want for personal reasons, like to complete a set. That is: there is wider variance in prices received for "obscure" cards. Sometimes they go cheap, and sometimes way expensive. In my experience selling on eBay, this actually happens. I had one set where I sold graded commons from the same set, and, it turned out, some of them went for two or three times as much as others. Of course, they were different players, but ... they were all classed as commons, and there was no obvious reason why one should go for that much more than another. It just so happened that some cards had more interest than others, for what I think was just luck of the draw. As I argued, ABJ would selectively wind up in the "expensive" obscure card auctions, since they'd never be the only bid, and they'd never bid until the price passed $3. Likely, the "obscure" cards are probably the ones for which they overpaid the most. Now -- and here's the weakest part of my argument -- maybe those are the cards they paid more for, on an *absolute* basis. Maybe the scarce cards went for, say, $12 each, on average, and the commodity cards went for, say, $7 each, on average, just to pick numbers out of a hat. In that case ... it's possible that the more expensive cards, overall, would actually be expected to return less on resale than the cheaper cards! And, since the black sellers got more expensive cards, at a statistically significant level, maybe *that's* why they earned less. Not racial bias, but worse cards. Here's a made-up example of how that might happen. There are five commodity cards, where you pay $2, $4, $6, $8, and $10, and their resale value is 80% of what you paid. And, there are five obscure cards, where you pay $8, $9, $10, $11, and $12, but those have a resale value of only $3 each. The obscure cards cost you an average $10 each; the commodity cards cost you $6 each. If you predict resale price from purchase price, using all ten cards in the regression, the coefficient is positive: for every additional $1 you pay, you get an extra 16 cents in resale. But: suppose you give the black sellers the $4 and $8 commodity cards, and the $8, $11, and $12 scarce cards. Now, they're selling cards bought for an average of $8.60. The white sellers get the rest, which were bought for an average of $7.40. The black sellers receive $18.60 for their cards. The white sellers receive $20.40. The white sellers got higher prices than the black sellers, even though they sold "more expensive" cards. When you run a regression to include a dummy variable for race, you find that the coeffiecient for "black seller" is negative 57 cents. That works -- it matches the direction of every effect in the actual study. The black sellers receive less money for cards that actually cost more, with no race bias whatsoever. What makes this work is that the *category* of cards is more important than the *purchase price*, and cards in the loser category tend to be the ones that cost more. Why do I think this is what happened? Here's one thing. The lowest selling price for any card was 99 cents, because that was what ABJ chose as the minimum bid. If you look at the study's ""Figure 3b", which shows selling prices, it turns out that white sellers had only 7 cards that sold at the minimum, while black sellers had 16 of them. Now, that could be racial bias ... but it could also be that black sellers just happened to have more "obscure" cards, that were the overpriced ones, that are more likely to have only one bidder. Why do I favor the "obscure" hypothesis over the "racial bias" one? I find it much more plausible, in general. The idea that eBayers are so racially biased that, for nine extra cards, *none* of the thousands of baseball card collectors on eBay wanted to bid $1.24 because the seller was black ... that seems way too extreme. But even if you don't agree with that ... there are probably other things it could be. When the study itself shows that there was a significant difference between the two sets of cards, you have to at least suspect that there might be something else going on, don't you? Look, suppose it turned out that the black sellers had wound up with mostly hockey cards, and white sellers with mostly baseball cards. Wouldn't it be plausible that hockey cards resell for less because they're easier to overpay for? Or, suppose that the black sellers had wound up with ungraded cards, and the white sellers with graded cards. Again, couldn't the argument be that ungraded cards are easier to overpay for in an auction format? Now, suppose that the black sellers wound up with cards that originally cost more, and white sellers with cards that originally cost less. Which is what happened! Isn't it plausible to argue that there might be something about the "expensive" cards that makes them actually harder to resell than the "cheap" cards? Even if I haven't got that "something" exactly right? If we had the complete data, we'd have a way to test my hypothesis, that the price difference between the groups is causing the effect. You could take a random sample of 50 cards from the white group, and 50 cards from the black group. If the black group still has more expensive cards, on average, throw it away and repeat. Eventually, after several tries, you'll have a random sample with roughly equal card prices in both groups. Test that new sample, based on the original eBay sales, and see if the results still hold. You can repeat that a few times, if you like, and see what happens. I think a weakness in all of these studies was an insufficient understanding of baseball cards and baseball in general, which is why I liked your first article so much. It would be great if there was someone who had deep baseball and memorabilia knowledge as well as an advanced statistical background, to work on this topic. Sometimes I think about doing some analysis myself, but just don't have the time (or statistical background). I'm a bit late to the game here Phil, but I do find the argument pretty contorted. I agree that your argument is possible, but by definition it has a less than 5% chance of being true. They find similar results for a good that doesn't have the sort of variation in quality that your argument requires. Is it really that implausible that racial bias exists, especially when study after experimental study finds it? I don't agree that by definition it has a less than 5% chance of being true. What do you mean by that? I only read the abstract on the iPod study, but that one I believe. First, no eBay guarantees or protection. No feedback on the seller. You're buying a more expensive item. You're buying an item that is one of the most stolen. You're buying an item where the original owner can track you down if it's stolen (I assume there's a "where's my iPod" function). Also, that one doesn't have an auction format. A decision to buy, or how much to offer, is based on a conversation you have with the seller. It's a completely different animal. In fact, I'd bet that the same effect would be found from *younger* sellers. I bet people would be more reluctant to conclude a transaction with an 18-year-old student than a 40-year-old housewife. Re age vs. race: of course, I wouldn't be surprised to see an age effect either. People discriminate on a huge number of factors. I had forgotten that the iPod study was done on Craigslist (it appears) rather than on eBay. It would be interesting to see if eBay's guarantee, seller reputation, etc. makes a difference. In some sense, though, that's what the baseball card study is getting at, it's repeating the previous study in a different market environment and finding similar results. Which seems to indicate that the difference in market and product isn't changing the nature of the racial bias. Re the 5%: Let me re-phrase. I just mean this in the classical hypothesis testing sense. If the p-value is 0.05 and you're right that there is in fact no bias, then there's a 5% probability of getting this extreme of a result (either via your argument or any other similar mechanism). Your argument is based on the idea that the effect they find results from random variation in unusual vs. usual cards. This is squarely in the realm of standard, frequentist hypothesis testing. If I accept your argument here, I have to accept similar arguments for every randomized trial that's ever been run. You can always check baseline balance on 20 variables, find one that is significantly different at baseline at the 5% level and concoct a story for why this invalidates the results. T-tests are overrated but they make sense for an experiment if they make sense anywhere. Finally got a chance to read that study more thoroughly. I was surprised to find that they actually *didn't* assign the cards randomly. They did it using an odd procedure based on the alphabetical order of the cards they bought/sold. This makes your argument somewhat more plausible to me, though it still seems unlikely since the purchase price difference favors the black sellers (viewed through the simplest lens).